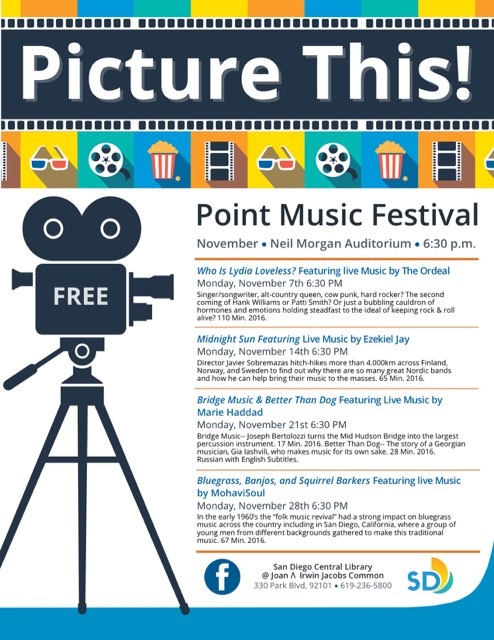 We’re thrilled to team with Robert Surratt, Library Assistant for Arts, Music & Recreation at the San Diego Central Library, for Picture This, the 2016 Point Music Film Festival! Each film will be showcased in the beautiful, state-of-the-art Neil Morgan Auditorium. Each Monday in November, we will feature an independent music-only film that showcases talented and inspiring artists, bands and music stories. Our mission is to spotlight the talented filmmakers and inspiring music that collectively contribute to San Diego’s dynamic indie-arts and entertainment scene. From bluegrass to jazz to folk to rock and roll, Point Music Festival is a wholesome tribute to the universal power of music and the arts. Point Music Festival is proud to be a part of the energetic repertoire of San Diego Music and Film Festivals. Admission is free; each film night begins at 6:30pm. Seating is on a first come basis, so arrive in plenty of time to catch the live music set from one of our fine city’s talented bands/musicians that will open each film. We look forward to seeing you in November to celebrate the diversity of amazing indie artists and inspiring film makers.